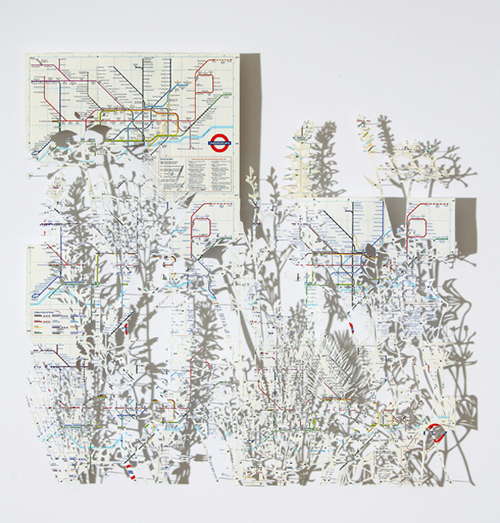 Here is my piece that will be in the 'Mind The Map' exhibition. I have blogged about this before and indeed if you hop over to my website you will see the piece. I thought it would be nice to show the piece in a bit more detail here. 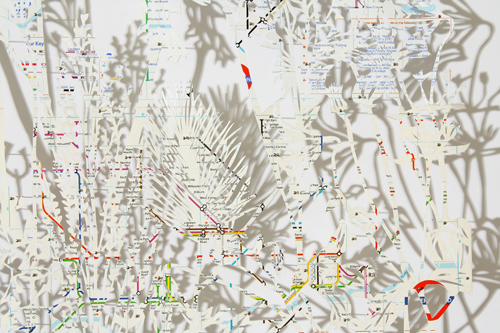 The piece is made out of London Tube maps dating from 1987. 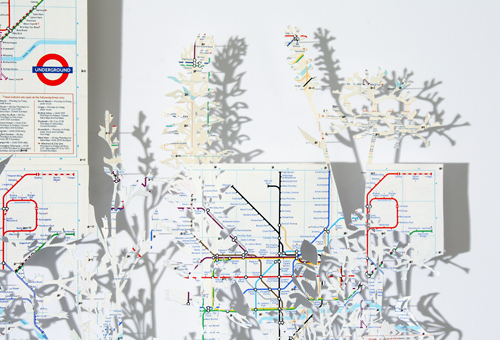 When I was commissioned by The London Transport Museum I was given a pile of old tube maps to work with. As I went through them I realised there were several printed in 1987. That was the year I moved to London to go to university. My first time living away from home as well as my first time living in London. It was a time of great adventure and change and was also sometimes lonely and a bit sad. Seeing the tube maps from that time it took me back to that time, it was an almost proustian moment, the maps were like a conduit back to that time. As you can imagine my friends and I spent a lot of time exploring all that London had to offer and I usually had a tube map tucked into my bag to help me get around. You can see me talking more about the piece here. I chose flowers and plants as the subject matter as I like the way nature takes over in the city when humans are not looking. And like always looking great. Just discovered your artwork through Mary Nasser's blog. Awesome work. Very inventive. Fabulous piece Claire! Beautiful detail. I can relate to it in a few ways. Your first year in particular in London - wonderful moments mixed with bittersweet ones - and lots of travel on the tube! I love your observation of nature making its way back into the city when we're not looking. Beautiful piece, I would love to see it in person. I love the serendipity of it being your first year in London. Always such a huge step moving away for your first year of uni!